Le Saint Julian is one of Singapore's most popular and respected French restaurant and has partnered with Lifestyle Adventures to create a fine dining experience on Sea Duction. Le Saint Julian has been recognized by winning many industry awards, the latest being the Singapore Business Review Restaurant Award. 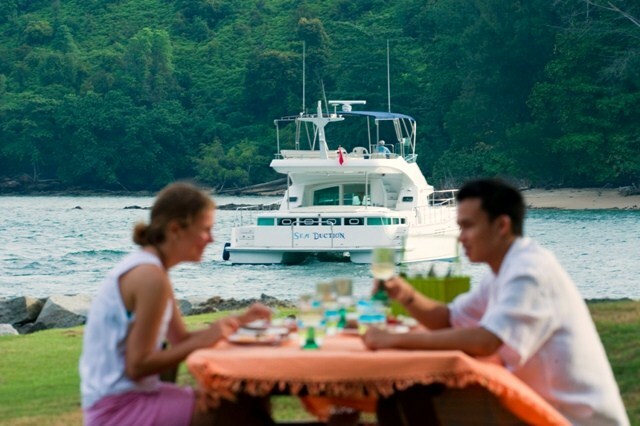 Sea Duction, distinguished for its graceful and elegant presence, Catamaran, 44 ft x 22 ft x 3 levels of entertaining environment, combined with the atmosphere in dining on the tranquill sea of Singapore, served by the famous chefs of Le Saint Julian, will make the a night you will never forget on-board. The enticing menu emphasizes French cuisine prepared by the award winning Chef Julien Bompard , whom is passionately devoted to the reproduction of the true flavours of french cooking. The elegant bar offers a great selection of wines by the glass , it is the perfect setting for social gatherings and events on the water. The success of Le Saint Julian is based on serving well-prepared French food, executed with explicitness and taste and served with flair, care and attention. In keeping in style, we are offering our services on board the new 44 ft Power Catamaran Sea Duction by Lifestyle Adventures, where you can be enticed by our menu's and wines, looked after by our chefs and staff. Distinguished for its fascinating character and strong identity, the atmosphere in the main dining area is always stylish without being stuffy. The enticing menu emphasizes authentic Italian cuisine prepared with the best ingredients imported directly from Italy. The elegant bar offers a great selection of wines by the glass and excellent cocktails; it is the perfect setting for social gatherings and events. The success of Garibaldi is based on serving well-prepared Italian food, executed with explicitness and taste and served with flair, care and attention.